Since 1929 the Australian Red Cross have been responsible for the collection, processing and distribution of blood and blood products to the Australian community in need, or whose lives have been touched by tragedy. It’s estimated that the Australian Red Cross save 100,000 Australian lives each year, thanks to 500,000 donors. 100,000 lives saved… half a million generous donors… and for the first time, the Australian Red Cross passed a million donations per year. the person who gives the blood and the person who receives it. Thanks to the generosity of blood donors, countless people have received the precious gift of life, while others are able to enjoy a much-improved quality of life through regular treatment with blood and blood products. 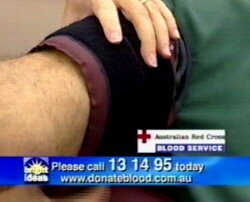 80% of Australians will need blood in their lifetime, but less than 3% give blood each year.